Our two-week trip to Kauai included few plans: just some well-deserved downtime. 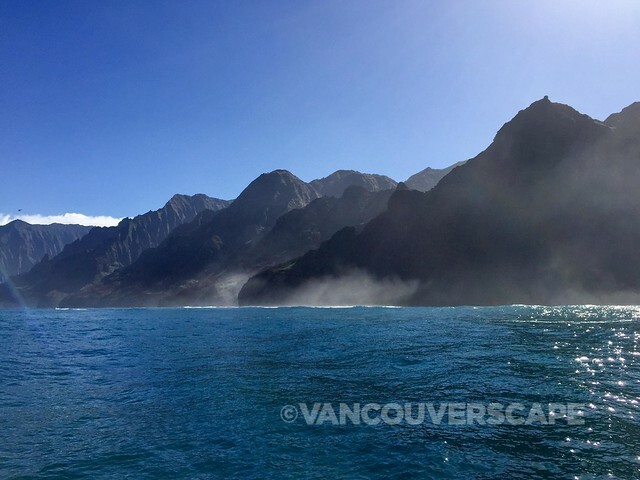 But after checking out photos online of the island’s famous Na Pali coastline, we made a point of getting onto a boat to enjoy that heavenly scenery. Much of Na Pali is inaccessible due to its characteristic sheer cliffs that drop straight down, thousands of feet into the ocean. Due to its remote location, Na Pali remains one of the most beautiful and pristine coastlines in the world. We booked a morning snorkel picnic sail with Capt. 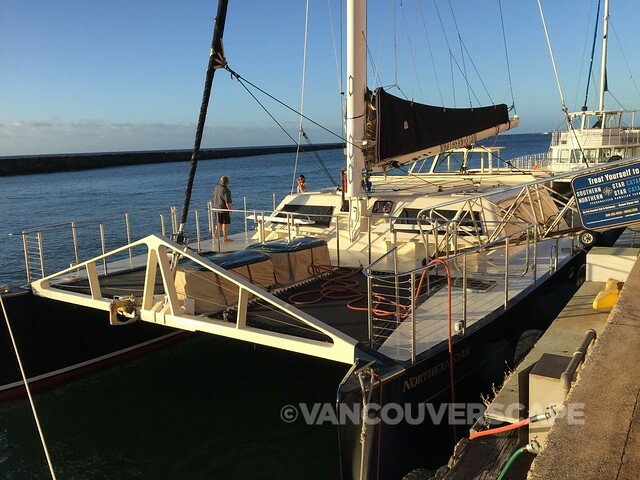 Andy’s on one of their two 65′ Gold Coast catamarans. The only items we’re asked to bring are towels, hat and sunscreen for a day out on the water cruising the coast. As we board the ship, shoes are left on shelves at the dock. 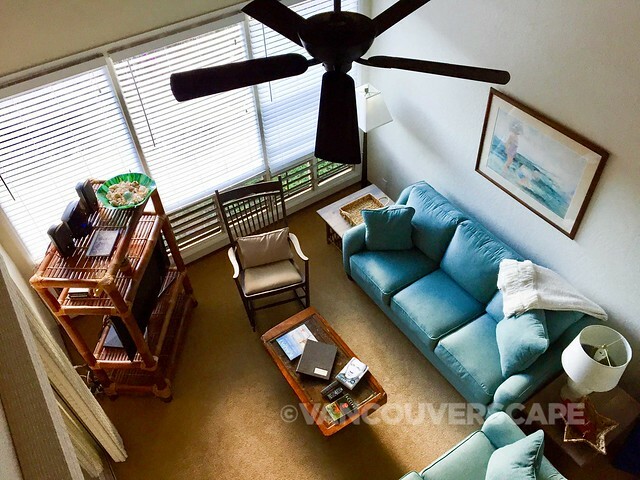 The ship’s interior is fitted with hardwood floors, a full kitchen and downstairs bathrooms. Captain Bernard and the crew greet us with smiles and we’re soon in the cabin getting a quick safety briefing. Breakfast on board is served continental style (sausage cakes, veggie cakes, fruit, coffee, juice). Waking up at the crack of dawn for the morning sailing (7:15 am check-in) means an excellent chance of seeing Hawaiian Spinner dolphins that cruise up this gorgeous coast. Our morning snorkel destination is chosen based on winds and currents. On this day, we start off snorkelling on the early side of the tour while conditions are calm. After a few quick tips on snorkelling, we’re ready to get into that warm, tantalizingly blue water. Maddy stays near the group on a surfboard, looking out for us (there’s close to 40 of us on this sailing) and keeping an eye out for honu (Hawaiian green sea turtles). 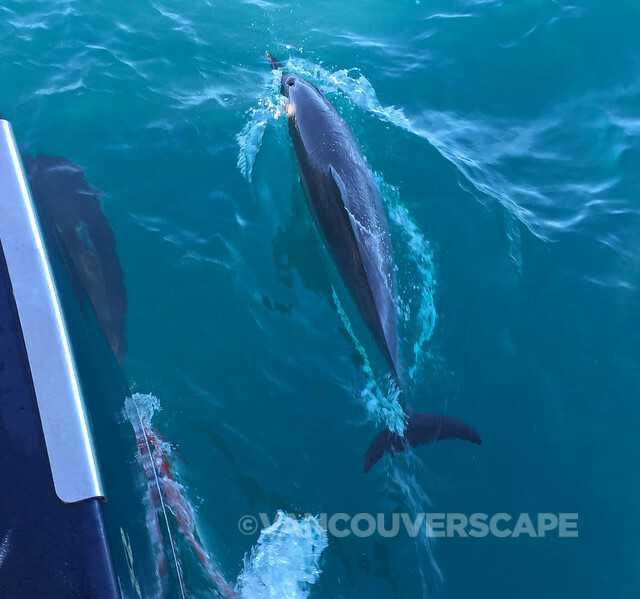 Post-snorkel, towards the turning point of our cruise, we get lucky with a few playful Bottlenose dolphins at our ship’s bow, and later several pods of spinners as we sail downward along some of the most stunning scenery I’ve ever encountered. 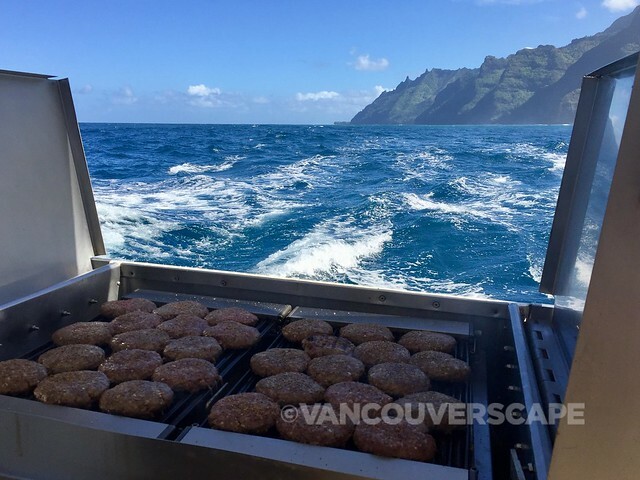 Meanwhile, Chef Mark’s busy at the stern grilling up burgers and teriyaki chicken filets for lunch. Joe comes around to take our lunch orders. 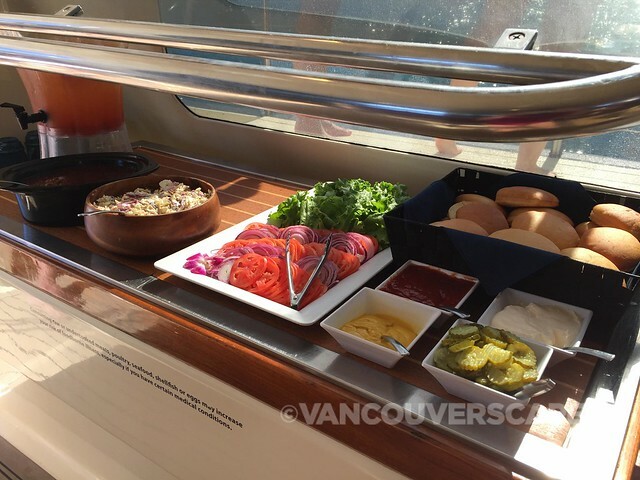 There’s a buffet on both sides of the cabin set up with homemade baked beans, veggies, condiments, coleslaw plus a freshly-baked batch of coconut white chocolate macadamia nut cookies for dessert. Did I mention the open bar? We get beer and wine (plus soft drinks) served us as we chat and enjoy some tunes while headed towards the harbour. Throughout the tour, Captain Bernard provides interesting insight into the island via its history, nature, geography and currents. 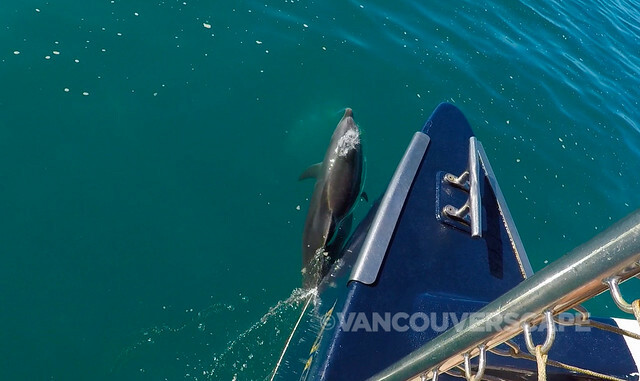 During our sail back towards the harbour, we can kick back while the crew keeps their eagle eyes peeled for dolphins, turtles and whales. 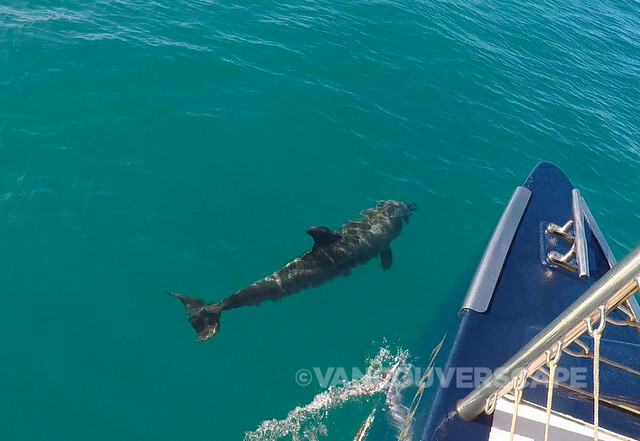 Every time our boat slows down, our group jockeys into position along both sides of the catamaran, armed with cameras and smart phones. 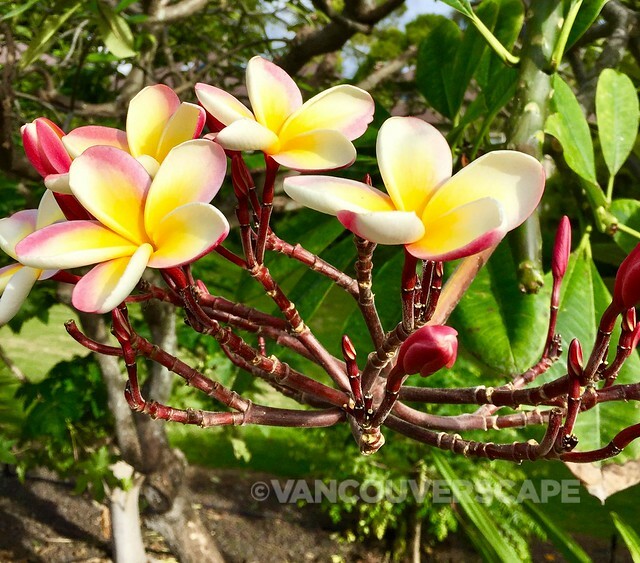 We much looked forward to – and enjoyed – taking this tour in between days of snorkelling and boogie-boarding at our favourite Poipu beaches as well as exploring Kauai’s gorgeous nature. All Capt. Andy’s tours depart rain or shine from Port Allen in Eleele. Adults, USD $169; children 3-12, USD $119. A big thanks to Captain Bernard, Joe, Maddy and Mark for a fun day at sea. 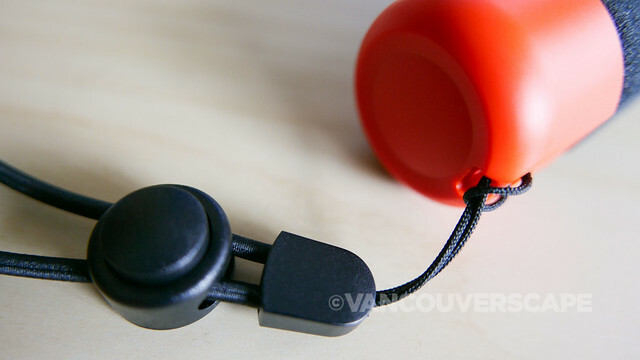 We brought along GoPro’s newest floating grip, The Handler (USD $29.99). 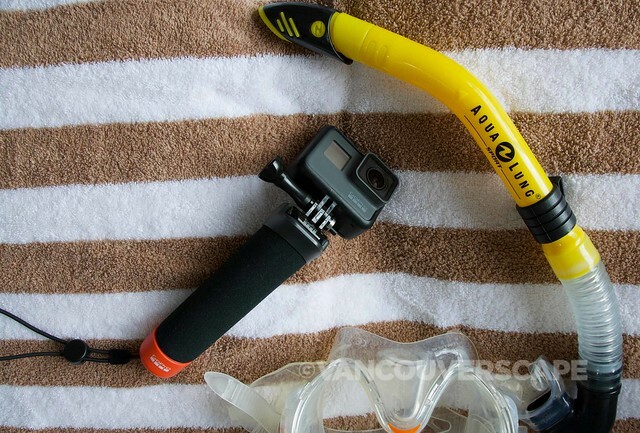 Attach a mount onto its a quick-release base, put on the wrist strap and you’re ready to go for a snorkel, kayak, surf or wake-board adventure. I like that it’s lightweight, making it easy to capture various angles both in and out of the water. And compared with the Chesty mount, you can get a little closer to the action when extending the pole with your arm. 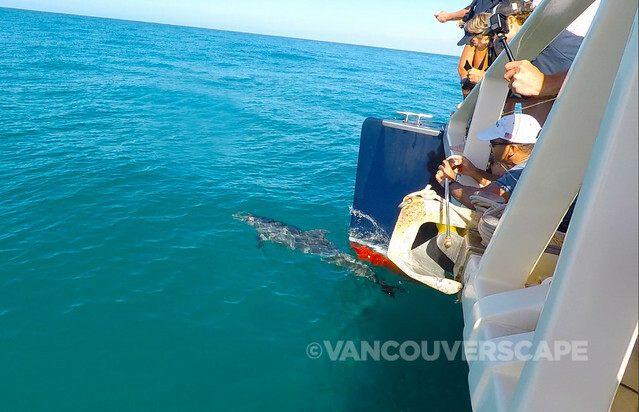 When dropped into the water, it’s easy to spot The Handler via the bright orange part of the handle, made of non-slip material for a secure grip. It’s also compatible with all GoPro cameras. Our home away from home is a two-level condo in Poipu Crater Resort, one of two managed by Parrish Properties, an island-wide luxury property company. We’re in the middle of a botanical crater, right on top of Poipu Beach, close to Brenneke’s for boogie-boarding and after some amazing snorkel sessions, happy hour inside their lounge. 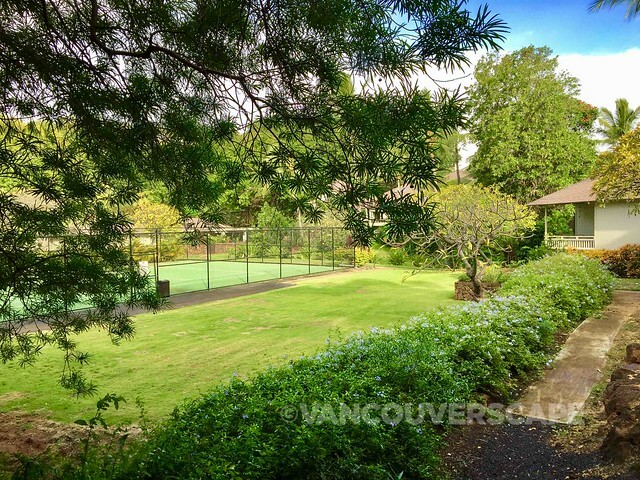 Everything we need is here, from a full kitchen, closet filled with beach gear, washer and dryer to a beautiful private lanai tucked within serene botanical flora. Birds visit day and night, their unique calls and colours adding an element of aloha to our most comfortable and relaxing stay on the island. Headed down to the USA from Canada? Consider a data plan from our friends at Roam Mobility. Their stress-free talk, text and data plans make navigating roads, keeping in touch with family and staying on top of emails a breeze! Visit Roam online to learn more about their data packages, including longer-term (minimum three months) “snowbird plans”.